New Jersey Property Taxes Are Out of Control! Your home or commercial property values have dropped. Shouldn’t your property taxes drop as well? 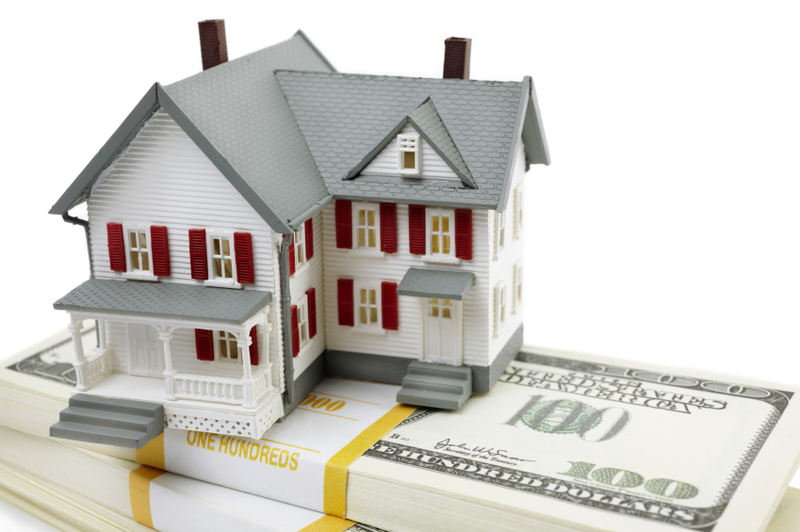 visit us on FAQ About NJ Property Tax Appeals found here. YOU NEED TO BE A PART OF IT !! In New Jersey you have the right to file a property tax appeal on your real estate, whether it’s residential or commercial, vacant land or industrial. New Jersey requires you pay taxes based upon the fair market value of your property. Nothing more! If you think you are paying too much in property taxes, we may be able to help. As NJ real estate taxes skyrocket, many taxpayers have begun to look for ways to reduce their tax payments. One common method of accomplishing this is filing a tax appeal. However, since tax appeals afford relief only to those taxpayers who take action and learn their rights, the decision of whether to file an appeal will require a cursory understanding of how the process works. At Hanlon Niemann, we are familiar with the real estate market throughout Northern, Central and Southern New Jersey including Monmouth County, Mercer County, Somerset County, Union County, Middlesex County, Ocean County, Atlantic County, Camden County and Cape May County. These are unprecedented economic times. well worth the time and effort involved. If you authorize us, we will take the necessary action to reduce your taxes and save you money. From negotiating your taxes with the local tax assessor, analyzing the property record card and appraisals, and finally, appealing your tax bill to the County Board of Taxation, we’ll be with you each step of the way. Call our office today. Ask for Mr. Niemann to personally discuss your property tax situation toll-free at (855) 376-5291 or e-mail him at fniemann@hnlawfirm.com. A NJ taxpayer considering a property tax appeal should understand that he/she must prove that his/her assessed value is unreasonable compared its fair market value. By law, your current property tax assessment is assumed to be correct. To win, you must overcome this presumption of correctness with evidence to reverse that assessment. 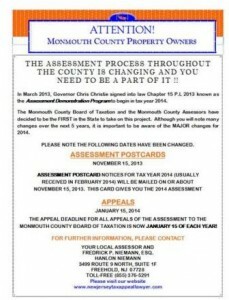 If you feel your New Jersey property taxes are too high due to an inaccurate assessment, you have a right to file a tax appeal to the county tax board where your property is located to seek a reduction of your property’s assessed value. Doing so saves individuals and businesses thousands of dollars per year or more in property taxes. If you need to speak with a New Jersey attorney about a residential or commercial property tax appeal, we encourage you to contact our law firm in Central, New Jersey to schedule a consultation with an attorney. Call us toll-free (855) 376-5291 and ask for Fredrick P. Niemann, Esq. Following a revaluation, all assessments must represent 100% of the true market value of the real estate as of October 1st of the pre-tax calendar year. The October 1 pre-tax date is called the annual “assessment date”. All evidence submitted in a tax appeal must be on or near the assessment date, especially property sales used as comparables. The other standard is the “common level” or common level range established in your municipality. To explain the common level range you must consider what happens following a revaluation. or reassessment. Once a revaluation or reassessment is completed, external factors such as inflation, appreciation, and depreciation may cause values to increase or decrease at varying rates. The State Division of Taxation annually conducts a fiscal year end sales survey, investigating most property transfers that occur in your community, with your local tax assessor assisting. Every sale is compared individually to its official assessment to determine an average level of assessment in the municipality. An average ratio is developed from a sampling of these property sales. In every year, except the year of a municipal wide revaluation or reassessment, a common level of assessment is established and represents the average assessed valuation in which your property is located. This number is used by the Tax Board to determine the fairness of your assessment. Sales ratios are reviewed annually. Sound confusing? Don’t be deterred. At Hanlon Niemann, we’ll get you through it. If you need to speak with an attorney about a residential or commercial property tax appeal, please contact Fredrick P. Niemann, Esq. toll-free at (855) 376-5291 or email him at fniemann@hnlawfirm.com.